So far I’ve enjoyed the intangible benefits of airplane ownership. It’s nice to have the airplane there whenever I want to use it, and to park my car next to it in the hangar. I’ve flown on some hot days, but the heat hasn’t been a problem since the airplane is stored in the shade. I can open the side window for taxiing, and the air vents work very well in flight, especially up front. I’ve gotten used to fueling the airplane, putting it back in the hangar, and tying it down, a few things I didn’t have to do much before. I started working on my instrument rating in October 1996. The older radio was about to become obsolete, so I had a new digital one installed. Then the VOR/ILS display went way out of tolerance, so I had it replaced with a new digital VOR/ILS indicator. I got to the first annual in September 1997 with no maintenance other than a few oil changes. Airplane engines usually burn a quart of oil every few hours, but I usually have to add only one quart between each 25-hour oil change. There were no serious problems. I had an alternate static system installed, among other things. When the annual was started in late 1998, the compression in some of the cylinders was low enough that I decided to get a major engine overhaul done. The engine was about 200 hours short of its recommended overhaul interval (TBO), another reason I had hoped to sell before this situation arose. The overhaul process went more smoothly than I had expected, mainly because my new mechanic had worked many times with the shop that did the overhaul, and the overhauler is not too far from my home airport. Due to the amount of money I had to spend, I’ve decided to keep the airplane for a while before trying to sell it again. There’s no way I could sell it for what I’ve spent on it, so I will essentially be waiting for the market value to get closer to my investment. 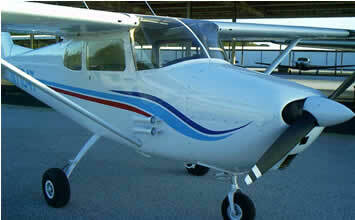 In the spring of 2003, I had a complete paint job done to the airplane. It was stripped down to bare metal, corrosion was removed, and many pieces of small hardware like screws and bolts were replaced. The photo above shows the new paint job.